Address: 9701 S. Old Oregon Inlet Rd. OCEANSIDE -This fabulous vacation home is just a Short Walk to the Beach w/Direct Ocean Access. Blue Tide is a wonderful choice for those seeking to enjoy the rituals of summer on the Outer Banks. Built & Decorated w/Many Thoughtful Details such as Large Pool Area w/Fiber Optic Lighting, Comfortable Built-In Seating around the Pool Area and shaded Picnic Table/Grill Area. The Updated interior is a delight w/Hickory Wood Cabinets & Wainscoting, Cathedral Ceilings, & Wet Bar Area that all make this home a Great Destination for Your Family Vacation! Ground Level: Parking, Steps to Mid Level w/Entry, & Steps to Mid Level Covered Deck, Sun Deck w/Steps to Deck w/Hot Tub, Private Swimming Pool (Can be Heated for $150.00 Per Week, Per Week in 2019) - Please Bear in Mind that Pool Temperature is Subject to Outside Temperatures & Conditions), Enclosed Outside Shower & Gas Grill. Mid Level: 4 Master Suites (3 w/Queens, & 1 w/Duo Bunk), 4 Full Baths, & Covered Deck. 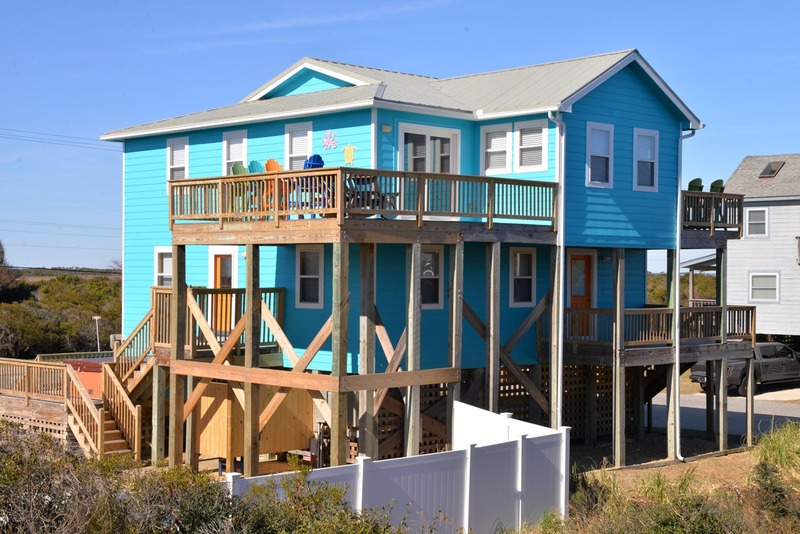 Top Level: Living/Dining/Kitchen Area, TV, VCR, Full Bath, Half Bath, Master Suite w/King & Full Bath, & Sun Deck w/Ocean View. 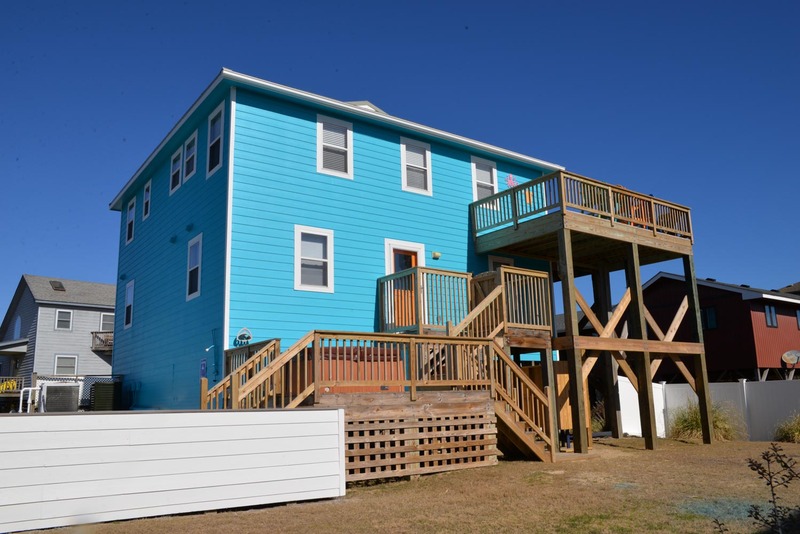 Features include: C/AC & Heat, Washer/Dryer, Dishwasher, Microwave, Phone, TVs, VCR, DVD, Wireless Internet, Stereo, Ceiling Fans, & Deck & Pool Furniture. No Pets. This is a Non Smoking Unit. Great vacation home! We loved the open living area. It was nice having a bathroom with every bedroom. The pool & hot tub were popular with our family. A very nice home to rent especially if you have small children. You are on the beach side and can walk to the beach without crossing the road. The pool and the hot tub are a plus to just cool off from the beach. Excellent location, particularly with young children. Pool size is great for small kids as well. All rooms were comfortable. And the pool and hot tub were lovely! This is a fabulous house and a great location! Home is in good condition. It is set up to handle a good group of people. Proximity to the beach is Great! The pool and the Hot Tub are also an asset. Easy walk to beach. Away from busy traffic areas but convenient to Outlets restaurants and shops. Fish from beach or short distance to pier. Lovely house! Beautiful view of the sunrise, great location, and very welcoming and relaxing. Beach area is very nice. Just a short walk to the beach. Very well stocked with supplies like silverware, dishes, pots and pans. Nice and clean. This is a wonderful house for 8-10 people. We and friends have vacationed in this property for several consecutive years. The pool really is a plus for the kids/grandkids and in case the weather is \iffy\"."